Complete Streets are streets for everyone. Whether people are traveling by car, bicycle, transit, or as pedestrians, they need safe, comfortable and convenient travel routes. 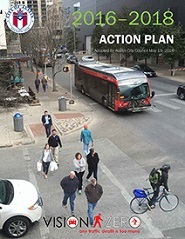 The City of Austin is proposing to develop and implement a Street Impact Fee Program. A Street Impact Fee would be a charge assessed on new development to pay for the construction or expansion of roadway facilities that are necessitated by and benefit that new development. 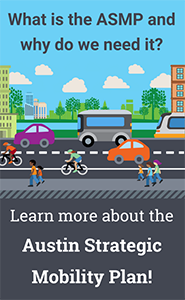 Our department’s Transportation Demand Management Program works to encourage sustainable modes of travel and relieve traffic congestion in Austin and its regional neighbors. Transportation demand management promotes solutions that move trips to off-peak hours or shift drive-alone trips to other forms such as public transit, walking, biking, teleworking, carpooling, and vanpooling.